RESEARCH: Jessie Jennings first defined this type in 1941. Caryn Hollingsworth reported on this type in 1991 from the Sheeps Bluff Shelter. Jenkins reported this type from as he conducted surveys along the proposed rote of the Tennessee-Tombigbee Waterway in Alabama and Mississippi. TEMPER: This is tempered with sand, mica and sometimes clay fragments. The exterior color ranges from light gray to tan to red or dark brown. Both interior and exterior surfaces may be burnished. SURFACE DECORATION: The surface is plain; however, the single sherd recovered at the Sheeps Bluff Shelter site had a red slip or film on the surface. Examples can have a single line of punctations around the exterior of the rim done with a single cord or reed. An appliqué strip may be added around the rim adding thickness. VESSEL FORMS: Known forms include deep or shallow globular bowls, some with inverted rims. Rims are sharply everted at a 45 to 90 degree angle from the body of the vessel causing the lip to be flattened, otherwise they are rounded or slightly flattened. The bases are either conoidal or flattened-conoidal. One Mississippi site contained a vessel with a flattened handle that had been broken off. CHRONOLOGY: This type dates to the Middle Woodland period as an expression of the southern Hopewell and Marksville cultures between 300 and 600 A.D. Associated point types might include Maybon points. 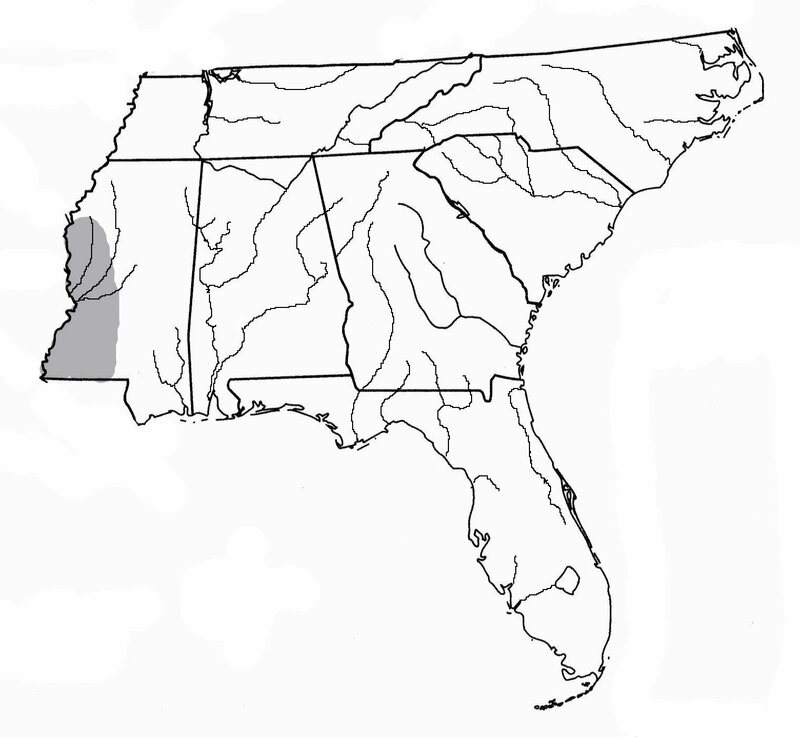 GEOGRAPHIC DISTRIBUTION: This type is found along the watershed of the upper Tombigbee River in Alabama and across northern Mississippi into western and central Tennessee. RESEARCH: This type was named by Philip Phillips, James A. Ford and John B. Griffin in 1951 from their survey of archaeological sites across Mississippi. TEMPER: Clay particles are the more dominant tempering material present in this type. In some paste, both sand and shell may be present. As the content of sand in the paste mixture becomes more abundant, the type becomes classified as Thomas Plain. The texture is coarse, lumpy and contorted in appearance and brakes with a jagged, irregular edge. The surface color is usually gray and drab, but is also known to be pink, buff or red. The core ranges from buff to gray or black. Surfaces tend to be smooth, but may be rough and are chalky. Polished surfaces will have smoothing marks. SURFACE DECORATION: There is no design or decoration beyond the identifiable rim treatments and appendages. Most rims are simple and unmodified with a rounded or flattened lip (estimated 85%); however some rims have been thickened on the interior or both interior and exterior surface adjacent to the lip, in which case the lip is often beveled or flattened. Rim decoration may be in the form of rim folds formed by paddling, creating a single fold, or creating a second fold on top of the first fold. The folded rims may be rounded, squared, flattened or even triangular in cross section. The depth of the folds can vary widely and may be decorated with nicking, notching, pinching or punctation. A second form of rim treatment is a single incised line on the rim interior, exterior or both at variable distances from the lip, but usually not more than 2 cm. The incised line can vary in width and can, on occasion, have punctations on or beneath it. A third treatment consists of notches (above), pinches or appliqué strips immediately at the lip. A forth treatment consists of reed or straw or fingernail punctations that appear to separate the rim and the shoulder of the vessel and have been known inside the lip. Fifth, a single row of nodes may line the edge of the rim. Finely, perforations may appear 1 to 4cm below the lip that seems to have been drilled after firing. VESSEL FORM: Vessels are simple, open or incurved bowls and jars. Lips may be rounded, squared, beveled or pinched. Lips on jar forms are often rolled outward while bowls can be beveled. Lips can be notched, nicked, pinched or have one incised line, usually on beveled rims. Bases are rounded or flattened. CRONOLOGY: This type belongs to the Middle to Late Woodland, Tchula and Baytown periods. Associated point types include Scallorn points. GEOGRAPHIC DISTRIBUTION: The type is known from central and northern Mississippi and perhaps western Tennessee and eastern Arkansas. RESEARCH: Charles Falkner identified and discussed this type from the Tennessee Valley in 1968. Jones recovered some 90 sherds of Bell Plain pottery at the Davison Creek site. Philip Phillips, James Ford, and James Griffin defined this type from their survey of Mississippi in 1951. Their definition of the type was reprinted in the Handbook of Mississippi Pottery Types, SEAC Bulletin No.7 in 1968. TEMPER: Finely ground shell was used as temper in this type. The sherds are soft and tend to break along coil lines. The exterior surface is dark gray or red in color. The surface is smooth to nearly polished and is “soapy” to the touch. SURFACE DECORATION: The vessel surface is plain and smooth. Separating this type from Mississippian Plain in northern Alabama might be nearly impossible. Some rim decoration occurs in order of frequency: nicked, notched, notched or pinched horizontal rim fillet, pinched, punctated, or single line. VESSEL FORMS: These vessels often appear as well-made simple, curve-sided bowls; flattened globular or ellipsoidal bottles with short collars and exterior rolled rims and interior bevels; bowls with flattened bottoms and flaring sides; and a wide variety of effigy forms. Appendages are rare, but single loop handles are known. CHRONOLOGY: The Bell site in Tennessee belongs to the Late Mississippian period. GEOGRAPHIC DISTRIBUTION: Jones recovered this type in central Alabama at the Davison Creek site and Charles Falkner identified its appearance in the Tennessee Valley. Phillips, Ford and Griffin recovered this type from sites scattered throughout the alluvial valley of Mississippi. RESEARCH: Philip Phillips and Gordon Willey named this type in 1939 from their survey of Mississippi archaeological sites. 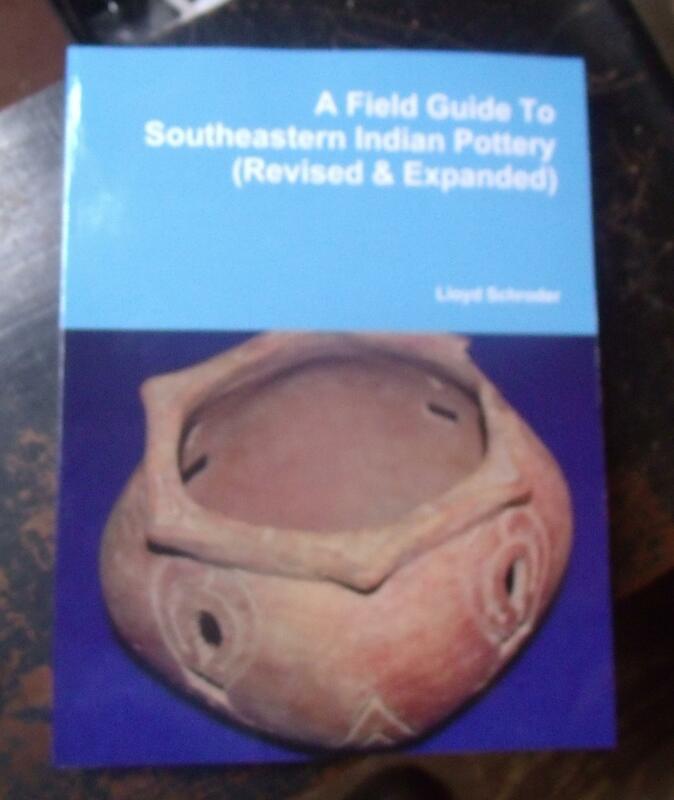 Robert M. Thorn and Bettye Broyles reprinted their description in the Handbook of Mississippi Pottery Types in 1968. TEMPER: This pottery, built with annular rings or coils, is tempered with clay particles, sand and carbonized vegetable matter (charcoal). The surface is smooth and chalky. Surface colors range from light gray to buff or brown with a gray core. SURFACE DECORATION: The surface is void of decoration, but is well smoothed with smoothing marks apparent. This type probably had a red slip over the surface that may be worn away through time. There is no evidence of any other decoration. VESSEL FORM: Three vessel forms are known. The most numerous form is the beaker with straight, vertical out-slanting or in-slanting walls. Deep caldrons are also known with straight or in-curving rims or with constricted openings that flare above the shoulder. Two forms of carinated bowls are known; one with a moderately deep bottom and sharply angled in-slanting upper rim. The second form is similar, but with straight, vertical sides or sides that slant slightly outward. Bases are flat and round or flat and square with well defined corners. A few bases are convex. Appendages are present in on beakers and bowls in sets of four and give a quadrangle appearance to the vessel. They come in the form of ovate or triangular forms with rounded corners that either protrude upward and outward from the rim at a 45 degree angle from the rim, in which case they are made as part of the body, or are a horizontal flange that extends from the rim in the form of triangles. This type of appendage will have Coles Creek decoration (concentric parallel lines) on their top or sides. CHRONOLOGY: These vessels are part of the Middle Woodland, Coles Creek period. Associated point types would include Colbert, Scallorn and Alba points. GEOGRAPHIC DISTRIBUTION: Coles Creek Plain pottery is known across all of southern Mississippi and into Alabama at least as far as the lower Tombigbee River basin. RESEARCH: This type had never been formally defined, even though it makes up a large part of any Lamar site. Caldwell discussed, but never formally described it and Robert Wauchope reportedly used the name Lamar Plain Smoothed which might be the same, but it remained unnamed until Brent Wiseman defined it in 1992. Wiseman’s research was done at the Fig Springs Mission site in Columbia County, Florida. TEMPER: The distinguishing trait of this type was the coarse grit particles used as temper in its paste and its smooth exterior surface as well as the decorated rims common to this type. SURFACE DECORATION: This is smooth and well made plain pottery. Rim fragments make the plain sherds easier to identify as rims have an appliqué strip that is pinched or punctated with reed. VESSEL FORMS: Vessels are jar forms that are slightly constricted below the orifice. Bases are rounded. Rims are folded or an appliqué strip is added and pinched or crimped. CHRONOLOGY: Lamar pottery dates to the Late Mississippian, Lamar period in Georgia, but Lamar is contemporary with Fort Walton pottery. Along the coast of Georgia, Lamar (Irene) stamped pottery continued longer. Florida Gulf coast occurrences are in the Safety Harbor periods. Associated point types might include Mississippian Triangular (Pinellas in Florida), Ichetucknee and Guntersville points. 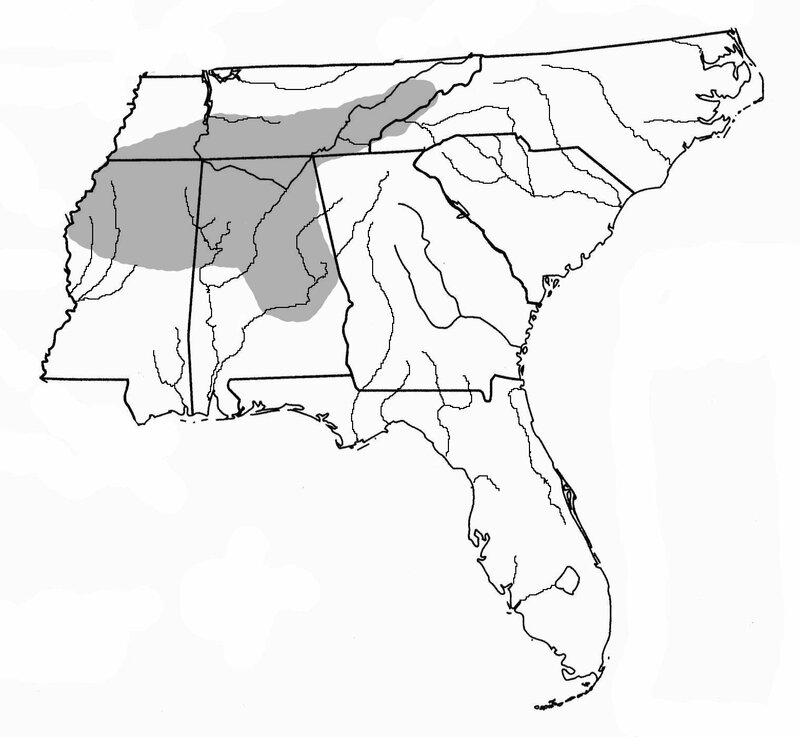 GEOGRAPHIC DISTRIBUTION: Lamar Complicated Stamped is found throughout most of Georgia and into adjacent Alabama, Florida and South Carolina. Similar types are seen in North Carolina and eastern Tennessee. In Florida it occurs as far south as Tampa Bay, but these occurrences may be only the result of trade. Eastern extensions in Florida are not well known but probably also occurs there only as trade if at all. RESEARCH: RESEARCH: Steve B. Wimberly reported on this type in 1960. Wimberly’s report on this type was from sites in Clarke County, Alabama. TEMPER: Fine sand and a mixture of clay particles, usually lighter in color than the surrounding paste, were used as temper. The paste core is gray and the exterior is buff. SURFACE DECORATION: This ware is plain and without any surface decoration. VESSEL FORMS: Sherds suggest a simple, medium deep bowl with rounded vertical sides with a slightly constricted opening on taller bowl forms. Bowls have a flat, round base. A second bowl form with a slightly everted rim is known. Rims are direct except this second jar-like bowl form. Narrow, rounded exterior rim folds occur on some rims while others are almost flange-like. Other rims are wedge shaped, frequently with an incised line. CHRONOLOGY: This type belongs to the Middle Woodland period dating between AD 01 and 400. Associated point types are Wilson, Edwards and Maybon points. GEOGRAPHIC DISTRIBUTION: Distribution for this type is from Mobile Bay to Clark County, across Louisiana, eastern Mississippi and most of Arkansas. RESEARCH: Hollingsworth reported his findings in 1991 and Oakley and Driskell reported on the Redstone Arsenal sites in 1987. Hollingsworth did his research at the Sheeps Bluff Shelter site in Franklin County, Alabama. TEMPER: This is a clay-tempered pottery type. SURFACE DECORATION: This pottery has a plan surface. VESSEL FORMS: Hollingsworth recovered fragments of the boat-shaped vessel. Other forms include vessels with flared walls and flattened bottoms. CHRONOLOGY: This pottery is part of the Middle and Late Woodland periods dating between A.D. 500 and 1000. Associated points include spike points, Woodland Triangular, Baker’s Creek, Camp Creek, Copena, Yadkin, Greenville, and Swan Lake points. GEOGRAPHIC DISTRIBUTION: This type seems to be limited to northwestern and north central Alabama. It did not appear in the Chickamauga Basin survey done by Lewis and Kneberg. It was present at the Redstone Arsenal sites explored by Oakley and Driskell. RESEARCH: Hollingsworth mentioned this type in 1991. Hollingsworth did his research at the Sheeps Bluff Shelter site in Franklin County, Alabama. TEMPER: This is shell-tempered pottery. SURFACE DECORATION: The surface of this type is plain and well-smoothed. All plain, shell-tempered pottery in the Moundville complex in northern Alabama is classified as Mississippian Plain. VESSEL FORMS: Vessels are globular jars with straight to out-curved rims and rounded lips. Most examples have strap handles fastened to the shoulder and at the lip. CHRONOLOGY: This type is a classification for all shell-tempered Mississippian period pottery, dating between A.D. 1000 and 1540. Associated points include Mississippian Triangular and Guntersville points. GEOGRAPHIC DISTRIBUTION: This type is found in the upper portions of the Alabama and Tombigbee Rivers and extends to the Tennessee River Valley. It is probably found in the northeastern part of Mississippi and perhaps the northwestern edge of Georgia. RESEARCH: Carey B. Oakley and Boyce N. Driskell recovered examples of this type at sites on the Redstone Arsenal, reporting on their work in 1987. TEMPER: This type name is applied to all limestone-tempered plain pottery. SURFACE DECORATION: Two surface treatments have been noted. The roughened surface (left &, bottom examples) is associated with the Late Woodland period and is often categorized as Flint River Brushed. The more smooth surfaced type (two right examples) has lumps of limestone clearly on the surface, but is more smoothed than the later roughened type, belongs to the Early and Middle Woodland period. CHRONOLOGY: The smoother examples with podal supports belong to the Early and Middle Woodland periods. The roughened, Flint River brushed type belongs to the Late Woodland period. GEOGRAPHIC DISTRIBUTION: Wimberly states that this type is found in Louisiana, Mississippi and north-central to northwestern Alabama and Clarke and Mobile counties, Alabama. RESEARCH: This type was first defined by Philip Phillips, James A. Ford and James B. Griffin in 1951. The type was defined during their survey of Mississippi. TEMPER: This is a coiled pottery that is tempered with crushed shell particles of varying sizes. The paste is poorly wedged and laminated. Surface color is usually gray, but reddish extremes are known. Cores are usually gray. Surfaces are smoothed, but rarely moderately polished and are often roughened through leaching. SURFACE DECORATION: There is no decoration on this type. Rim decoration can appear as (most common) nicking, notching, pinching, single-line incising, and rim strips, followed by punctating, application of nodes, plain folds on interior and exterior, vertical ribs or strips of clay (above), and crimping. VESSEL FORM: Vessel forms are most commonly the standard Mississippian globular or sub-globular jars, but also include simple bowls, globular bottles with low to medium high vertical neck, flat-bottomed dishes (rare), and a vast number of effigy forms. Appendages include lugs and handles. Lugs are horizontal, semi-circular and project from the lip, but some are bend downward sharply from the vessel lip or may project upward. Handles are less common and are straight to tapered strap handles that may have one or two nodes at the lip. Other handles may be loops confined to the rim, or arcades tapering downward that are attached flush to the rim or wall or are partially free standing. CHRONOLOGY: This is a Mississippian type that may have begun in the Baytown period. Associated points might include Alba, Hays, Scallorn and Homan points. 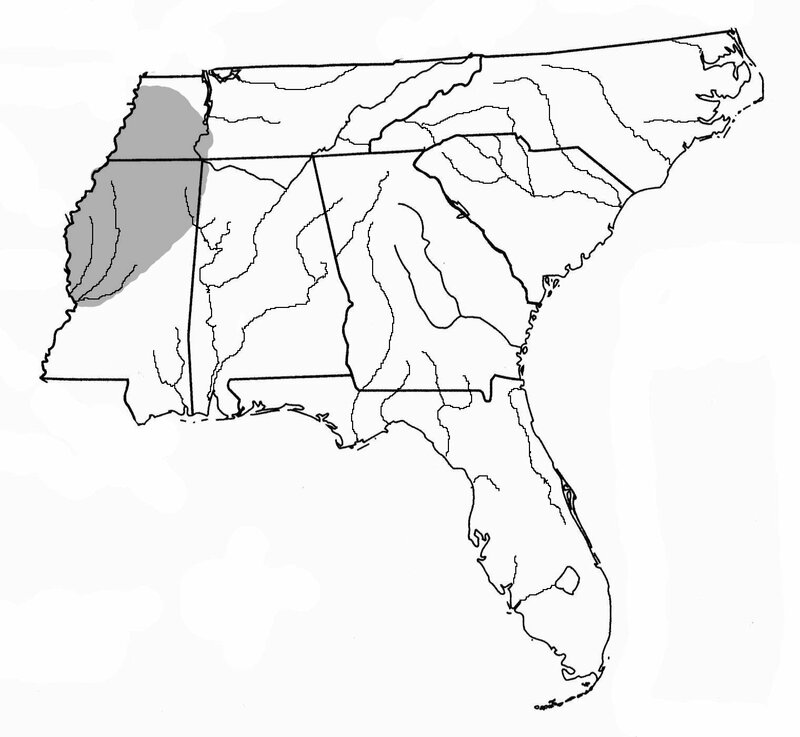 GEOGRAPHIC DISTRIBUTION: This type is known as far south as the Jaketown site in west-central Mississippi and as far East as Early County, Georgia. C.B. Moore recovered the two vessels above from Autauga County, Alabama. The type has also been recovered in many sites in Northern Mississippi and probably ranges into southwestern Tennessee and eastern Arkansas. RESEARCH: This type was first defined by Jesse Jennings in 1941. TEMPER: This is a coiled pottery type that is tempered with a mixture of fossil shell particles, sand and medium to coarse clay particles. The texture is homogeneous with evenly mixed temper. Surface colors range from buff to reddish brown, gray or black with a gray core. Surfaces are carefully smoothed. SURFACE DECORATION: There is usually no decoration on this type beyond a rare notching of the rim done with a rounded implement such as a stick. A few sherds have also had some crude incising along the neck of the vessel. VESSEL FORM: Vessels are usually wide-mouthed and globular jars with a constricted neck. Bowls are also known. Rims are vertical to out-flaring and may be thickened. Lips may be rounded or flattened, which produced a ragged edge along the outer edge. Bases are most commonly rounded, but may also be flattened. Appendages consist of beaded an appliqué band below the rim or flat, flange handles at or below the rim, both of which are common. CHRONOLOGY: Oktibbeha Plain pottery belongs to the historic period. The pictured vessel was recovered with other features in association with glass beads and is believed to be Historic as well and may be Chickasaw related. Related points include the Kaskaskia point. GEOGRAPHIC DISTRIBUTION: Jennings did not identify any specific sites for this type, but it is known across northern Mississippi, perhaps following the Chickasaw distribution in that area. RESEARCH: Bettye J. Boyles reproduced the notes of William Haag who defined the type in 1939. Hollingsworth found this type at the Sheeps Bluff Shelter site in Franklin County, Alabama and Charles Faulkner noted its presence in the Tennessee Valley sites of eastern Tennessee. TEMPER: This is a white sand-tempered pottery type. The exterior is usually fired to mouse-gray. SURFACE DECORATION: The surface is plain, but it is often polished or burnished with hemispherical bosses or rounded nodes between 4 and 7mm in diameter. These nodes either touch or are less than 2mm apart and appear 5 to 12mm below the lip. These are pushed through from the inner surface around the sides of the rim, then holes are filled and smoothed on the inner surface. VESSEL FORMS: Vessels appear to be jars with widely flaring rims. Bases are flat with podal supports. No complete vessels have been recovered. Rims are simple or set off with bosses. Lips are usually rounded, but do occur beveled with notches on the inside of the bevel, or with short (7mm) transverse lines across the outside of the lip. CHRONOLOGY: This seems to be related to the Early Woodland period as it follows fiber tempered wares in known sites. The vessel form for this type is very similar to one of the forms suggested by John Walthall (1980 p.101) for Alexander Incised pottery. Their similarity of tempering material, age and range in distribution in northern Alabama may suggest a relationship between the two types. Related point types are Coosa, Yadkin, Greenville, and Swan Lake points. GEOGRAPHIC DISTRIBUTION: This type has been found in the upper Tombigbee River valley and the Pickwick, Wheeler, and Wilson Basins of northern Alabama and the Tennessee River Valley in Tennessee. RESEARCH: Jessie Jennings defined this type in 1941 while investigating sites across northern Mississippi. TEMPER: This was a coiled pottery type that was tempered with fine sand and lumps of clay and perhaps flakes of charcoal. The texture is firm and compact, but the surface may show some lamination or layering similar to that of shell tempered pottery. Surface colors range from red-brown to brown or black while the core color is gray. Surfaces are smoothed to nearly burnished. SURFACE DECORATION: There is generally no decoration on this type. In a few cases there are impressions along the lip that seem to have been made with a stick. Some vessels may also display crude incising along the neck. These appear as shallow, vertical lines that run from the neck to the base of the rim. VESSEL FORM: Vessel forms include hemispherical and shallow bowls, jars with constricted openings, and large mouth globular jars. Rims are usually straight and direct with simple rims. Rims may also be serged or twisted, or can be everted and lips are flattened or rounded. Appendages appear as strap handles, small horizontal lugs at or below the lip, small and tapered non-perforated handles, and appliqué fillets positioned below the rim in combination with incising or punctation. CHRONOLOGY: This pottery type is part of the Historic period. Related points are Nodena points. GEOGRAPHIC DISTRIBUTION: The type is known across northern Mississippi and may have spread with the Chickasaw people into western Tennessee and northwestern Alabama. SURFACE TREATMENT: The interior was smoothed and the exterior was void of any decoration. Identification is dependent on tempering and vessel form. CHRONOLOGY: This type appears after the Furrs Cord Marked type during the late Middle Woodland and extended into the Middle Mississippian period. Related point types include spike forms, Woodland Triangular, Baker’s Creek, Candy Creek, Copena, Yadkin, Greenville, Catahoula, Homan, Alba, Hays, Scallorn and Swan Lake points. RESEARCH: Steve B. Wimberly identified this type from several sites within the Mobile Bay area and lower Tombigbee River area of southwestern Alabama in 1960. TEMPER: This type is tempered with large amounts of angular clay lumps with only slight amounts of fine to coarse sand in the paste. The exterior surface is poorly smoothed and lumpy. Fired surfaces are pinkish-buff, brown or gray in color and the core is dark gray. SURFACE DECORATION: The surfaces are smoothed with smoothing lines often visible and vertical on this type. VESSEL FORMS: Vessel forms include deep, conoidal bowls with podal supports and perhaps a hemispherical bowl with straight sides as a minority form. The rim tends to bend away from the body of the vessel about 1cm below the lip. Rounded exterior rim folds are known. Lips are rounded to flattened, sometimes producing a flanged look. Bases are conoidal with conical or wedged supports. CHRONOLOGY: Wimberly suggested an Early to Middle Woodland association for this type. The Tchefuncte culture lasted from 600 B.C. until A.D. 200. Related point types include Maybon, Edwards, Wilson, and Woodland Triangular points. GEOGRAPHIC DISTRIBUTION: Wimberly’s recoveries of this type suggest a distribution within the Mobile Bay area of southwestern Alabama. Pottery from the Tchefuncte culture has been recovered from northwestern Florida, Louisiana, western Mississippi, southwestern Alabama, Arkansas, eastern Texas, and as far up the Mississippi River as southeastern Missouri. RESEARCH: This type was defined by Douglas H. McKenzie in 1965. McKenzie cited examples recovered by C.B. Moore from the mounds on the Black Warrior River. Of the five pottery types named by McKenzie from this site, there were a total of 404 full vessels available and over 97,000 sherds, over 81% of which were plain. These vessels are ceremonial in nature. TEMPER: This is a coiled pottery type that was tempered with flakes of shell measuring between 1 and 5mm. Surface colors vary to include light to dark gray, buff to reddish-brown, to shades of light red or pink. Cores are usually dark gray, but may be buff or reddish-brown. Surfaces are usually smoothed with smoothing lines visible. SURFACE DECORATION: The surface is void of decoration. VESSEL FORMS: Jars and hemispherical bowls are the most common forms. Jars have straight, flaring or recurved rims. Bowl forms often have a notched appliqué strip added below the lip. Lips are rounded or slightly flattened. Small, flattened globular jars have vaguely defined shoulders. The bases are round-flattened. Appendages consist of one or two pairs, but in some cases as many as 17 pairs of strap handles that sometimes rise above the lip. Handles are sometimes decorated with small appliqué nodes. CHRONOLOGY: This type belongs to the Mississippian period, dating between A.D. 1250 and 1500. Related point types are Mississippian Triangular and Guntersville points. GEOGRAPHIC DISTRIBUTION: The distribution of this type is known from the Warrior River to the Tennessee River to an unknown distance both west and east where they integrate into other Mississippian Plain types.